Last updated 18 December 2018 . By Jess Halladay. Years back, when you said, “Ooh, I fancy a pizza”, the options at your disposal were limited to chain restaurants, takeaway kingpins and whichever kebab shop you could stumble into. Nowadays, an influx of slickly decorated, independent eateries into the capital means the same exclamation, and a quick Google search, renders hundreds of options and some tough decision making. But I can make it easy for you - if you’re in Shoreditch, check out Radio Alice. Uniquely housed in what was once a Victorian school, Radio Alice has those wide windows you can imagine parents walking away from while their kids’ faces remain glued to the panes, praying their mums turn around and come back for them. But nowadays, you’d be unlikely see someone clamouring to get out. Interiors at Radio Alice mix contemporary chic with kitsch, school-inspired furniture. 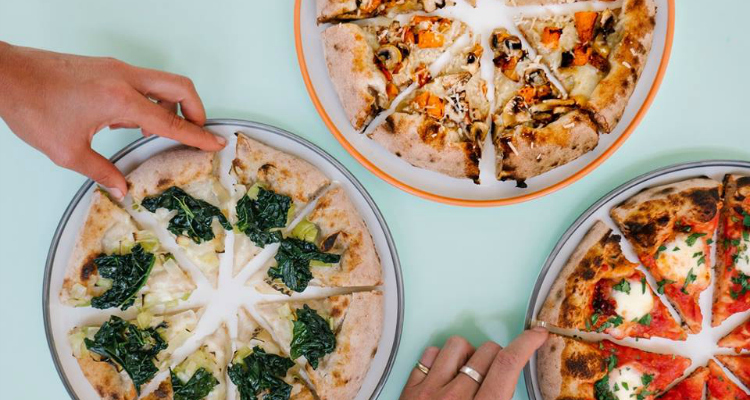 Serving up sourdough pizza with lashings of seasonal toppings, a crisp edge and light, fluffy base, the Radio Alice menu knows how to bring the crowds in, but it’s the chilled out ‘cool kid’ pizza parlour vibes that keeps them there. 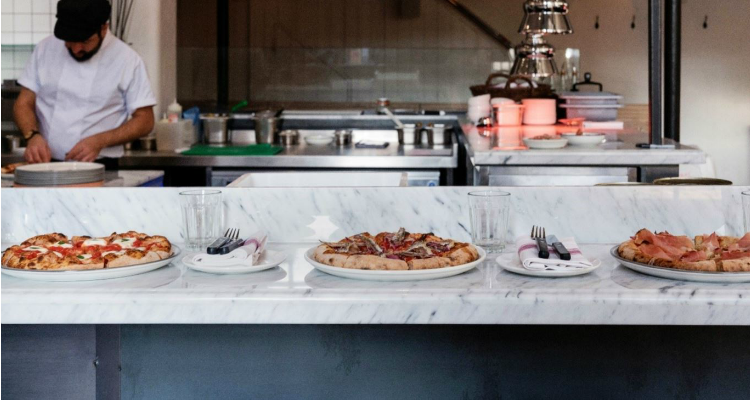 Sitting on the mezzanine-style top floor, you get the full view of their massive pizza oven, the marble-topped bar and the sky-high ceiling of the former school hall. There’s a great kitsch vibe running through the furniture, while modern art, low hanging lights and rustic half-painted brick walls add a sense of edgy chic to the interiors. If you pop on by come the weekend, they’ll be sure to get you in the mood for a night out on the town when they turn up the mix of party classics and contemporary bangers - it certainly got us ordering a couple more cocktails each before heading out for some dancing. Opting for a deconstructed pizza before the real deal we ordered the bruschetta with cherry and datterini tomatoes (£4.5) and Burrata with rocket, black olive & almond (£5.9) - the Burrata won this round for me; it’s that moment when you break the middle and the creamy cheese spills out that reminds you that heaven isn't a halfpipe, it's in a ball. 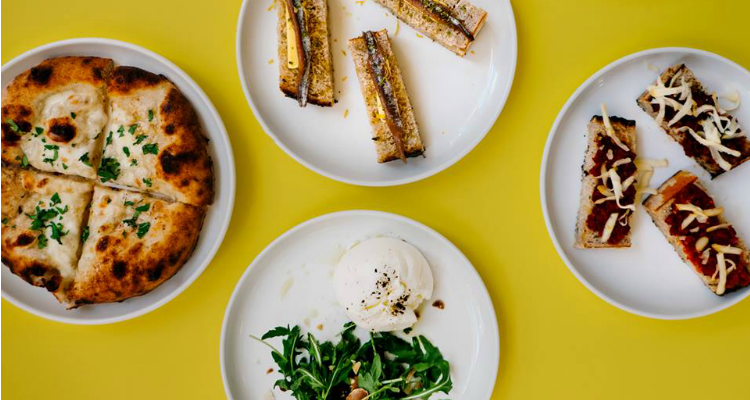 Bruschetta, burrata and more plates of Italian goodness. Mains-wise, the list is not endless, which is exactly what an indecisive person like me loves - a concise range of options to cover all bases; vegan, veggie, meaty, it has all the boxes ticked. That night we were definitely of the meat-loving persuasion. The Nduja (£11) was a wonderfully sloppy mix of spicy sausage and rich tomato with melted circles of gooey fiordialatte mozzarella to balance the heat. The Proscuitto di Parma (£12) offered a creamier slice sensation, covered with salty proscuitto, fragrant orange oil and oozing burrata. In true Italian style we washed our food down with a Spritz (£6.90) made with Berto Apperitvo, prosecco and orange alongide a signature Negroni (£7.40) which swapped the classic Campari for an alpine daisy infused Berto Bitter, alongside Gin A la Madame and vermouth. Radio Alice pizzas come loaded with only the freshest, most seasonal ingredients. Radio Alice is a modern and grounded pizza joint serving up slices with a roster of toppings to suit every crowd; paired with a delectable mix of traditional Italian cocktails to whet the whistle, I can see why the brand have become so beloved in London.